Los Angeles, host of the 2028 Summer Olympics, has an ambitious plan to move fans through traffic to the far-flung athletic sites: extend the city’s metro line with some help from the federal government. Trouble is, absent an assurance in writing, LA Metro faces a 22-month delay that could drive up the cost by $200 million. Congress has insisted that the White House fund new streetcar, heavy rail, and rapid transit bus lines, even as the Trump administration is slow walking a routine, but necessary, step. The hangup underscores the hostility to public transportation under the Trump administration, which sought to cut all transit grants in its 2018 and 2019 budget proposals except for those with full funding already in place. Congress rebuffed the spending proposal—not only funding the grant program, but also including language to mandate that the money be expended by a date and time. At issue in Los Angeles are Federal Transit Administration “letters of no prejudice,” which signal to public transit agencies that costs they begin incurring could qualify for federal reimbursement if grant applications ultimately are approved. The letters give transit agencies a measure of confidence that moving ahead is less risky financially. A Detroit Department of Transportation (DDOT) bus travels along Grand River Avenue in Detroit, Michigan, U.S., on Tuesday, Aug. 14, 2018. Los Angeles’s Westside Purple Line Extension tunnel bids expire next month and, absent a full grant, the project needs the FTA’s letter to start digging. Metro originally requested the letter in October of last year, and submitted a revised request at the end of August with the agency asking for almost $300 million less, according to LA Metro. Two earlier phases received federal transit grants. The setback for the third segment was “unexpected” and based on “new program requirements,” Sen. Dianne Feinstein (D-Calif.) said in a letter to Transportation Secretary Elaine Chao. Metro is working closely with the FTA to advance the project and is hoping for a grant agreement next year, the agency told Bloomberg Government. So far this year, the FTA, charged with evaluating transit projects and distributing grants, has issued one-third as many letters as last year. The agency is taking months under this administration instead of weeks to issue the documents, congressional aides and transit officials told Bloomberg Government. The letters don’t affect the federal agency’s balance sheets; local and private money can be spent — with the risk that federal money may not come. For its part, President Donald Trump’s administration says it’s simply doing due diligence to review the merits of each grant proposal. The foot-dragging can be costly when contractors have been lined up for projects, according to Scott Smith, chief executive of the Phoenix area’s Valley Metro Regional Public Transportation Authority. Valley Metro’s Tempe Streetcar project is one of three projects to secure letters of no prejudice this year. The Transportation Department said it is only ensuring the projects meet the agency’s requirements for capital investment grant money. Transit advocates see instead a thinly veiled attack on public transportation. “This appears to be just the latest example of the Trump administration’s deliberate attempts to sabotage the Capital Investment Grants program in defiance of Congress. The result is uncertainty for state and local transportation officials, project delays, and higher costs for taxpayers,” Rep. David Price(D-N.C.), ranking member of the Transportation-HUD appropriation subcommittee. In addition to Tempe project, the Seattle Center City Connector and San Rafael to Larkspur Regional Connector in California are the only projects in 2018 to receive a letter of no prejudice, according to the FTA. Only Small Starts projects, which require a one-year grant agreement, have received the letters. At least two New Starts projects, which require multi-year agreements, requested and then withdrew their requests after discussions with the administration, according to congressional data. The agency has executed two full funding grant agreements this year, both for Small Start projects. About 50 projects in the pipeline await full-funding grant agreements under the capital investment grant program, which includes both New Starts and Small Starts grants. Tempe had already received letters in previous years to buy streetcars and track materials. The team had a contract for construction with a guaranteed maximum price, but that contract was set to expire in November if work didn’t begin. 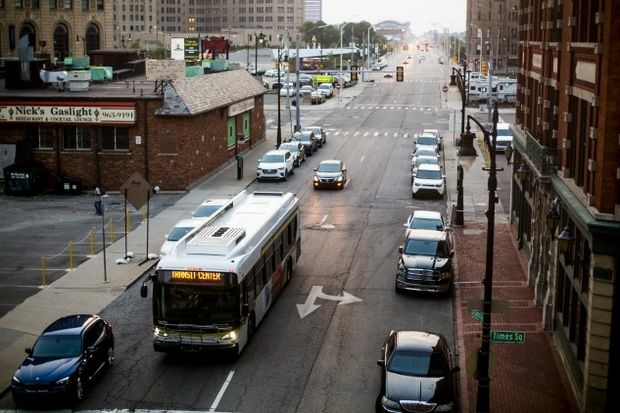 The city had hoped to have a grant agreement before then, which, according to congressional aides and transit advocates familiar with the program, would have been a realistic expectation. The fiscal 2018 omnibus spending legislation (Public Law 115-141) directs the FTA to spend 85 percent of its capital investment grants by the end of calendar 2019. Transportation spending bills for fiscal 2019 (H.R. 6147) include similar deadlines for spending by the end of calendar 2020. The FTA’s annual report for fiscal 2018 showed a capital investment grant kitty of $2.6 billion, with the agency recommending $1.2 billion for existing grants and oversight. Of the remaining roughly $1.4 billion for new projects, the agency has committed a total of just $50 million to fund two new projects. Much of the grant money has gone to multi-year agreements, many of which pre-date the Trump administration, according to transit advocacy group Transportation for America. Trump’s transportation agencies make it clear “the pipeline of transit projects should grind to a halt completely, leaving cities and communities on their own to raise yet more local funding than they already have to complete their projects,” Beth Osborne, vice president for technical assistance at Transportation for America, said in a statement. Tempe is glad to have its letter in place so work can begin and is optimistic about executing a full federal grant agreement by year’s end, Valley Metro’s Smith said. “This is an agency that is trying to get a handle on how to process this administration’s different view” of the grants,” he said. The post Local Transit Projects Hobbled as Trump Agencies Mum on Funds appeared first on Bloomberg Government.